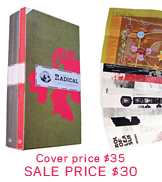 An Atlas of Radical Cartography is a collection of 10 maps and 10 essays about social issues from globalization to garbage; surveillance to extraordinary rendition; statelessness to visibility; deportation to migration. The map is inherently political-- and the contributions to this book wear their politics on their sleeves. An Atlas of Radical Cartography provides a critical foundation for an area of work that bridges art/design, cartography/geography, and activism. The maps and essays in this book provoke new understandings of networks and representations of power and its effects on people and places. These new perceptions of the world are the prerequisites of social change.